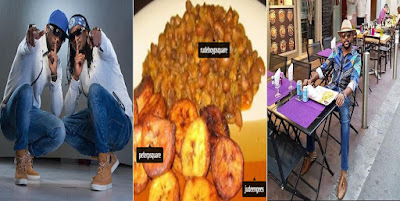 Using a food analogy in a special birthday message to Peter and Paul Okoye this evening, BankyW indirectly weighed into their split and shared very wise advice. I just got back to Nigeria yesterday, after the better part of 4 months away. Naturally, one of the things I missed the most while being away was the food. So I tried going to one of my favourite African restaurants to order some. Everything seemed normal until I tried to place an order. I asked for beans and plantain… the waiter said I could have one or the other, but not the two at the same time. I was confused. I decided to go for Jollof rice and chicken. Same story. Pounded yam and Egusi??? No, sorry, it’s either pounded yam OR Egusi.. not both together. I was actually at a loss for words. This didn’t make sense to me, at all. The waiter then tried to explain.. using words like “change”, “growth” and “trying a new direction”. But I didn’t and still don’t understand. Why change what was already perfect? He explained that any option I chose would still taste good. So, because hunger was killing me, I tried it. In the past few days I’d try plantain one day, and then beans another. Etc. And they did taste good. But they were perfect together. Absolutely perfect. The best of the best of African cuisine. It’s unfortunate that sometimes, with growth, change and whatever-other-word U wanna use… we end up losing sight of where and how we started, and altering what was a perfectly working combination. It makes me sad. But such is life I guess. For now, I will have to make do with either beans OR plantain, and either Jollof OR chicken, at different times. It isn’t quite the same though, so here’s hoping one day someone will realize that U should never have to choose between two good things, when both, together, make a perfect combination. I miss beans & dodo at my favourite restaurant. Sigh. In other news, happy birthday @peterpsquare & @rudeboypsquare.